Satire (noun) the use of humour, irony, exaggeration, or ridicule to expose and criticize people’s stupidity or vices, particularly in the context of contemporary politics and other topical issues. 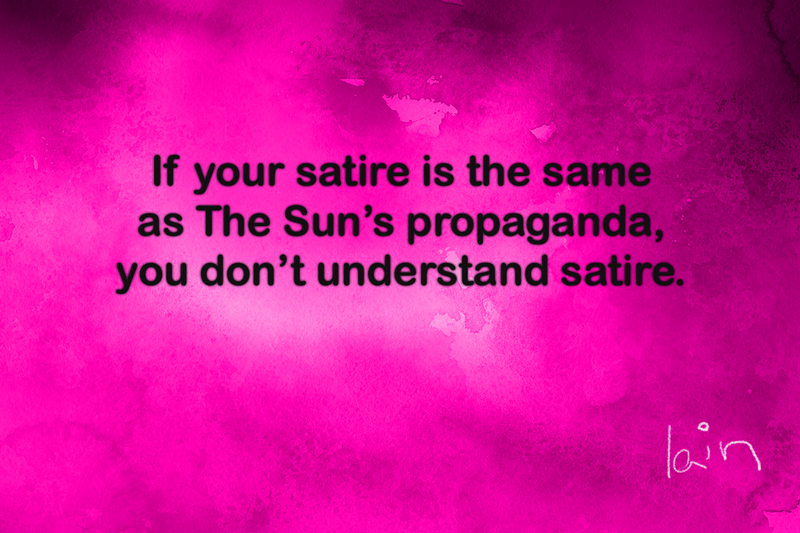 It’s an easy rule of thumb for would be satirists in the Uk, if what you write has exactly the same message as The Sun, The Daily Mail, The Telegraph, and The Times news and opinion sections, then your material is not satire, it is propaganda. If as a satirist you wish to satirise Jeremy Corbyn because you feel a need to expose something bad in the narrative, try ridiculing The Sun, The Times, The Daily Mail, The Express, Andrew Marr, Laura Kuenssberg, Dimbelby, Humphrys and the rest of the establishment stooges as they lie and demonise someone who stands against their masters, and sense of privilege. Tracy Ullman, Frankie Boyle, David Baddiel, your attacks on Corbyn are clearly for the few, and not the many. Over 120000 dead in the Uk due to the Conservative Party’s austerity cuts. Where is your material on that? The destruction of the NHS? Grenfell? Frankie Boyle has some, the others?